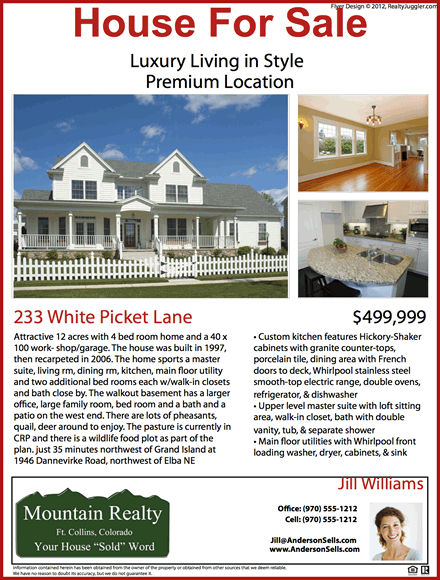 Flyers for residential as well as commercial Real Estate, co-listings & open houses. Click on the sample flyer image to the left to download a fully functional sample flyer. This flyer can be edited, printed and saved with no restrictions. You are free to use this flyer as our gift to you. This flyer is one of 101 unique flyer designs that are available in RealtyJuggler. Detailed instructions on how to edit flyers are available in our Flyer Tutorial Document. Flyer designs cover the full range of designs a busy REALTOR® or real-estate professional might require. 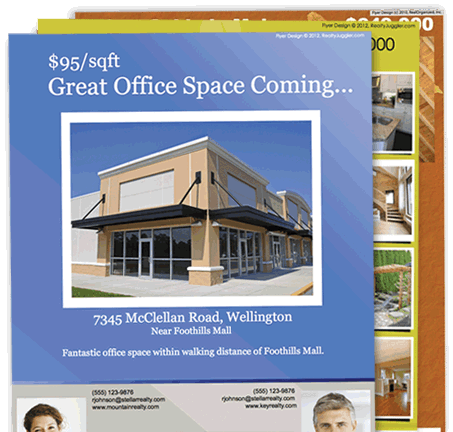 There are even flyers suitable for commercial listings, open houses, multiple listings as well and co-listings. Just pick a design, fill in the blanks, and you are done! Create your flyers in minutes. Just fill in the blanks and you are done. RealtyJuggler Real Estate Flyers are an ideal way to promote your listings. It will take less time to create your flyers and they will look more professional. RealtyJuggler is an easy-to-use organizer just for Real Estate agents. 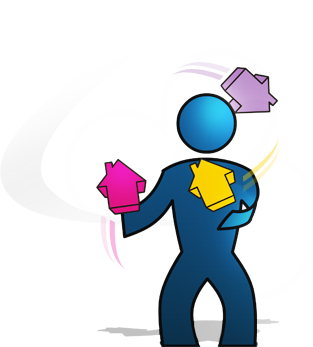 Our mission to provide a simple and affordable real estate CRM. These flyers are part of the RealtyJuggler system. RealtyJuggler is a Realtor's virtual Swiss Army Knife. Track Deals, Prospects, Open Houses, Lockboxes, Expenses, Calculate Commissions, Print Mailing Labels, do Drip mail, Bulk Email, and much more. RealtyJuggler is available as a 90-day free trial. This is literally a free trial with no cost to you. No credit card is required and you are never billed for a free trial. It takes just seconds to sign up.